First Generations.....For New Lines of Minis! This has probably been the a longest process coming... frustrating, expensive, time consuming....but the most rewarding project I have done with my goats. I am proud of this new line. A line nobody else has.....a line that will lay a foundation down for a whole new genetic base of Mini Nubians. A Foundation is what I wanted to create. I picked very high quality Nigerian bucks and crossed them with Proven, structurally sound, smaller statured Standard Nubian does. This required critical selection, time, feed, more time...and money. However, the outcome is starting to reveal itself. Some may look at these nannies below and think...."Look at those Airplane ears!"...... "She is small".........or "She doesn't look like a Nubian." However, keep in mind, all listed below are 50/50 crosses. The very best of Nigerian and the very best of Nubian. The breed character WILL come. I am taking these does and crossing them with "Obby", who is a higher % Nubian FINISHED MDGA &TMGR CHAMPION. I am confident in his bloodlines, structure, and ability to improve character. The second gens are hitting the ground and are making the ribbons in the show ring. As I continue this project....I want to keep creating. I want to build more generations of minis that will excel in udder structure, milk production, show ring appeal, and advance the Mini Nubian breed to a new height. My ultimate goal would be that my lines would be a benefit and building block in today's and future breeder's programs. With that said....I cannot keep them all. I have selected several 2nd gen daughters out of the girls below. They will be retained and look fabulous. I have brought in new lines to breed these daughters to. Simple multiplication states "I have too many goats!" Unfortunately, I want to advance with my lines and I cannot accommodate these numbers. Many buyers are not looking for low gens. I hate the thought of these dams listed below to go to the auction for pennies on the dollar. I want them to do what they were bred to do....and produce more great minis. That is why I am offering such a deal on these girls. I want them to stay within the associations and people like you that love good quality and good minis. Price includes free breeding to Obby......a FINISHED Champion or your buck of choice. I am super excited about this doe. She has some fantastic bloodlines and came to me bred to a nice nice 1st generation buckling with grand genetics too. I think she will make some top-notch minis this Spring with Brenda Price's "Nomad Wild Reckless Heart" as Sire. The product of this was "Wanda Waddles." Plus, this girl is such a sweetheart. Lil Lass is our only first generation doeling we were able to retain for the 2016 kidding season. She is a dandy and has the best little personality too...just like her momma, Danny. I am really really happy with the structure and width on this doeling. I think she will be a good example of what I am trying to achieve in raising foundation first gens for quality future minis. Pictured above is Lass in the pasture. Below Lass is "Silver Wings"....one of two lovely doelings she gave me from her first kidding. Silver won Reserve Champion jr. doeling at 2018 WCC. Her full sister is just as nice. Lizzie originates from Wendy Valentine of Soaring Heart's Farm. Wendy has been breeding quality minis for quite some time now and I appreciate the milk production her does possess. "Eunice" is out of my standard doe, Charise; making her a first generation mini Nubian doeling. I can't tell you how excited I am about these first generation babies. My hope is to produce quality foundation genetics to help broaden our registries. Granddam: "Clara" was shown at ADGA Nationals in 2005 as an eight year old doe. 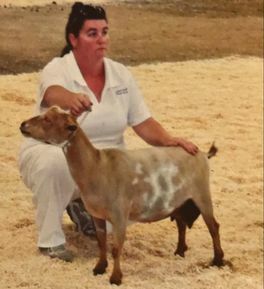 She received 1st place in her aged class and went on to win Reserve Champion All-around Nubian doe with Best Udder. "Laverne" is Eunice's twin sister out of Charise. Laverne has proven to be a good producer for the last two years. Look at the doeling on her side at weaning pictured below! She is as big as Laverne! I love this doe's depth, spring of rib, and soft udder. 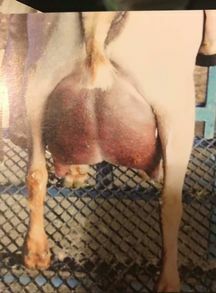 Her udder just keeps developing and growing. This is another "Clara" daughter from the Sand-Bur-Kids line. This doeling is a new addition with tons of personality and sometimes (naughty.) She was bred by Makayla Loper who offers fantastic genetics on both the Nigerian and Nubian pedigrees. Above is Addie's ff udder. She is dam raising triplets and doing a great job! Sand-Bur-Kids SC Clara 2005 ADGA National Winner. "Billy Jo" is Beatrice (above) twin sister. 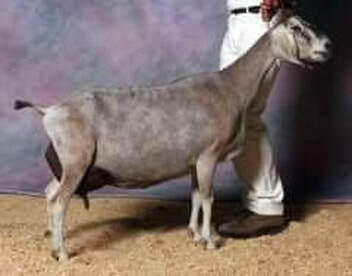 Again, her grandmother is a very decorated Nubian doe that won Best Udder and Reserve National 2005 ADGA Champion Nubian Sr. Doe. I cannot say enough about these bloodlines. Her Nigerian top side is definitely nothing to sneeze at either. Billy is pictured below as a ff. She gave me gorgeous kids this year. The female; I will retain. These two does are feeding kids that are almost their own size at weaning! Amelia is a doe that I obtained from Cory Neibert. She came to the farm with her beautiful momma, "Tiki." See Tiki on my "Standard Nubian" page. She is a very elegant doe with Iron Owl and Royal Cedars on her pedigree. The picture below is Amelia with the doeling she had for her first kidding. She was a fantastic mother.